Access can be very helpful when you need to tame a huge stream of data. Using Access, you can make the data easier to analyze, store, and summarize in reports. You can also use queries and macros to automate parts of the process, saving you time and helping prevent errors when it’s time for another set of reports. This article uses a sample data set to demonstrate how you might create a database using shared business data, automate importing the data, and create and distribute reports to folks who need a summary understanding of the data. To enable you to follow along as we explore this scenario, we’ve provided the sample data that was used to create this article, as well as a database file complete with all the data imported. The completed database contains all the queries, macros, and reports that this article explains how to create. These resources are offered as an installable package – all you have to do is download the package and run it. When you go to the download page, click the Download button to get started. You can run the installer right away, or save it and then install when you are ready. Note: The package requires that you have write permission on drive C: in order to install correctly. Download and install the sample resources from the Microsoft Download Center. The sample database also includes several forms and associated queries that further automate the database. These objects are not discussed in this article. For links to more information about forms, see the section Explore ways to get more out of Access. Move the file named January2010Sales.txt from C:\MonthlySalesReport\MonthlyData\ to C:\MonthlySalesReport\, and then rename the file MonthlySalesData.txt. Open Access. On the File tab, click New, and then under Available Templates, click Blank database. On the right side of the screen, type MyMonthlySalesReports in the File Name box, and then click Create. Access might open a new, empty table. If so, close the new table, but leave the new database open. You might see a yellow bar just under the ribbon with a button labeled Enable Content. If so, click Enable Content. Leave the new database open. You’re now ready to follow along. There are two ways to get external data: linking and importing. Linking is creating a connection so that Access treats the external data as if it were an Access table. Importing is bringing external data into Access but not creating a connection. The imported data becomes an Access table. This article explains how to import external data from a text file. When you finish importing external data, you can save the operation as an import specification that you can use again to repeat the process exactly. You can save a specification regardless whether you link or import. You use commands on the External Data tab to import source data. The following procedure shows you how, using the sample data as prepared in the preceding section. On the External Data tab, in the Import & Link group, click Text File. The Get External Data – Text File dialog box opens. In the dialog box, click Browse, and then browse to the C:\MonthlySalesData folder. Click Import the source data into a new table in the current database, and then click OK. The Import Text Wizard starts. On the first screen of the wizard, click Delimited, and then click Next. Note: Not all text data is delimited. The sample data was prepared as using comma-separated values, a common convention for managing data extracts from big data sources. Other text files might be delimited using other characters, such as semi-colons, or they may be fixed-width – that is, data where each value uses the same number of characters. On the next screen, select the First Row Contains Field Names check box, and then click Next. On the next screen, click Next. In most cases, you should use this screen of the wizard to review the fields in the text file that you are importing. To review a field, click the field on the wizard screen, and then review the options shown in the Field Options area. The sample data has been prepared so that this step is not necessary. Note: It’s usually a good idea to let Access create a primary key when you import data into a new table. However, the data you import may already have a field that is well-suited to use as the primary key. On the final screen of the wizard, type tblImport in the Import to Table box, and then click Finish. Access imports the data, and then opens the Get External Data – Text File dialog box. Leave the dialog box open – you will complete the next set of steps in the following section, Save the import specification. Note: You might not want to save the steps for some import operations. Saving the import steps is a good idea if you plan to import from the same data source on a regular basis – as is the case for this article and sample data set. For an overview of using external data, see the article Introduction to importing and exporting data. In the Get External Data – Text File dialog box, select the Save import steps check box. A new set of options appears. In the dialog box, describe the purpose of the import by typing in the Description box. This information will be stored with the specification, making it easier for someone else to understand what it is for. Note: In some cases, you might want to create an Outlook Task to remind you when the next import is due, and to provide an easy way to run the import from Outlook. The sample data in this case needs to be manually copied to the correct location before the import can occur, and an Outlook Task would not save any time, so we won’t use this option. If you want to create an Outlook Task for a saved import specification, select the Create Outlook Task check box before you click Save Import. Now that you’ve imported the first text file, it’s time to normalize the data. One of the main reasons to use Access is its support for relational data – data that is separated into discrete tables that are related to each other by common values. For example, one table might be about web pages and another table might be about monthly views of those pages. Each row in the page views table could be related to a row in the web pages table. If you stored all the data in one table, each row would have to contain all the information you need to know about the web page, instead of that information being stored once and represented in the page views table by a single value. A primary key is used to identify each record in a table. Every record in a table has a different value for the primary key. Primary keys often take the form of an incremented number – Access has a special data type that works well for this purpose, the AutoNumber data type. A foreign key is used to connect to a record from another table – to create a relationship. Records might have the same or different values of a foreign key. Foreign keys have the same or a compatible data type as the primary key to which they connect. Error reductionWhen you enter the same information over and over again, it is possible for mistakes to creep into your data. Normalized data helps prevent this by allowing information to be entered once and reused as needed. Reduced file sizeBecause each fact is only stored once, normalized data saves disk space. Improved performanceData that is normalized can be processed more efficiently, because data can be selected more precisely. When you import data from a source that is not normalized, it takes a bit of work to normalize it. However, you only have to normalize the data once – the first time you import. In subsequent imports you can use queries to move imported data into the normalized tables that you created the first time. In this sense, normalization is an investment: work up front to reap benefits down the line. For more information about normalization and database design, see the article Database design basics. Access provides a wizard that can analyze a table and normalize it for you: the Table Analyzer Wizard. Next, we’ll walk through the process of using the Table Analyzer to normalize data, using the sample data as imported in the preceding section. When you import data from a large external source, it might not be normalized. You can use the Table Analyzer to normalize data in Access. The Table Analyzer Wizard creates new tables to hold the data. Before you run the wizard, you may need to increase the value of the MaxLocksPerFile registry key. The default number of this key is 9500, which is too small to accommodate splitting the sample data. To change the registry setting, use the following steps. In the right pane of Registry Editor, double click MaxLocksPerFile. In the Edit DWORD Value dialog box, click Decimal. Make sure the value in the Value data box is at least 16000, and then click OK. Note: Some network environments may impose a limit on the number of locks per file. If you are attached to an office network, check with your network administrator before changing this registry setting. Restart Access, and open the database that contains the sample data. You only have to run the Table Analyzer Wizard once to create the tables. For future imports, you can use queries to move data into the normalized structure. On the Database Tools tab, in the Analyze group, click Analyze Table. The Table Analyzer Wizard starts. On the first screen of the wizard, you can read about the problems of data that isn’t normalized, and see some examples. When you are ready to proceed, click Next. On the second screen, you can read about what the wizard does, the benefits of normalization, and see some examples. When you are ready to proceed, click Next. On the next screen, in the Tables box, click tblImport and then click Next. On the next screen, you can choose whether to let the wizard decide how to normalize the tables. You should let the wizard decide unless you are familiar with the normalization process. For now, click Yes, let the wizard decide, and then click Next. Click Table1, and then click the Rename Table button (the button with a pencil and a table icon near the upper right corner of the wizard). In the dialog box that appears, type tblOrderDetails in the Table Name box, and then click OK.
Click Table2, click the Rename Table button, type tblProductName in the Table Name box, and then click OK.
Click Table3, click the Rename Table button, type tblSalesRegion in the Table Name box, and then click OK.
Click Table4, click the Rename Table button, type tblProductCategory in the Table Name box, and then click OK.
On the next screen, the wizard continues to display the proposed set of normalized tables, and provides an opportunity to specify the primary key for each table. On the tblOrderDetails table, click ID. Then, click the Set Unique Identifier button (the button with only a key icon near the upper right corner of the wizard), and then click Next. Click the arrow in the Correction column, and then click (Leave as is) at the top of the list that appears. On the last screen of the wizard, click Yes, create the query, and then click Finish. Access creates a query that combines the normalized data as it appeared in the original table, and runs the query. 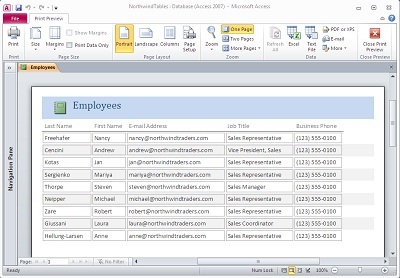 When the wizard is finished, Access Help opens and displays the article Normalize your data using the Table Analyzer. After you have normalized your data and created a table structure, you can use append queries to move future data imports into the new tables. You can then use a macro to run the saved import, the append queries, and drop the imported table so the database is ready for future updates. An append query selects data from a source and adds it to an existing table. It does not affect the data that is already in the existing table. The new data is added as rows at the end of the existing table. When you append data to a set of related tables, the order of the queries matters because relationships may require that values already exist in some tables in order for records to be created in others. This is the case for the sample data. For example, the data in tblProductCategory must be appended before the data in tblProductName, because each product in the second table has a category that must already exist in the first table. You can create an append query by using the query design grid, as described in the article Add records to a table by using an append query. When you work with your own imported data, you should use the design grid because it is easy to use. You can also create a query by opening a blank query in SQL view and entering the necessary SQL. This is convenient and time-saving if you already know the SQL that you need. We’ll use this method to create the append queries using the sample data. In the following procedures, we’ll look at SQL and what it does in the queries. For more information about SQL, see the article Access SQL: basic concepts, vocabulary, and syntax. On the Create tab, in the Queries group, click Query Design. On the Design tab, in the Results group, click View, and then click SQL View. Delete the word SELECT and the semicolon from the new query. Open a new blank query in SQL View. Press CTRL+S. In the Save As dialog box, type qryAppendProductCategoryFromMonthlyImport, and then click OK.
Access displays a message confirming that you want to append the data. Click Yes. Let’s examine the SQL for this query line by line. INSERT INTO tblProductCategory ( ProductCategory ) This line is an INSERT INTO statement. It tells Access to append data into the ProductCategory field of the tblProductCategory table. SELECT DISTINCT tblImport.ProductCategory AS Expr1 This line is a SELECT clause. It tells Access from which field to select values – in this case, the ProductCategory field. The DISTINCT key word tells Access that each value should only be included once, so duplicate values are ignored. FROM tblImport; This line is a FROM clause. It tells Access from which data source to select the values – in this case, the object tblImport, the query that the Table Analyzer Wizard created after normalizing the imported data. Note the semicolon at the end of this line – this tells Access to run the SQL and is required. Press CTRL+S. In the Save As dialog box, type qryAppendProductNamesFromMonthlyImport, and then click OK.
Let’s look at the parts of this query that didn’t appear in the first query. (SELECT TOP 1 [tblProductCategory]. [ID] This SELECT clause is the first line of a subquery – a query inside another query. You enclose a subquery in parentheses. The key words TOP 1 indicate that only the first value should be returned. For more information about using subqueries, see the article Nest a query inside another query or in an expression by using a subquery. WHERE [tblImport].[ProductCategory]=[tblProductCategory]. [ProductCategory] This line is a WHERE clause is part of the subquery. A WHERE clause provides criteria for Access to use to limit the query results. Only records that meet the criteria are included in the results. Press CTRL+S. In the Save As dialog box, type qryAppendRegionFromMonthlyImport, and then click OK. There aren’t any clauses in this query that we didn’t already see in the first two queries. Press CTRL+S. In the Save As dialog box, type qryAppendOrderDetailsFromMonthlyImport, and then click OK. Although this is the most complicated of the four append queries, it doesn’t have any clauses that we didn’t already see in the first two queries. To help avoid errors, we’ll create a query that checks the existing data to determine which months are already represented. When we create the macro, we’ll use this query to avoid importing the same month’s data twice. Press CTRL+S. In the Save As dialog box, type qryMonthsAlreadyImported, and then click OK.
Let’s look at the two clauses we haven’t seen before: GROUP BY and ORDER BY. GROUP BY Format([tblOrderDetails]. [OrderDate],"mmmm yyyy"), DateSerial(Year([OrderDate]),Month([OrderDate]),1) This line is a GROUP BY clause. It tells Access that instead of displaying values for all records, it should only display each value one time for the fields (or in this case, the expressions) that are in the clause. This clause is necessary because the Order Details table has many orders in every month. Note that in addition to the expression we used in the SELECT clause of this query, we also need to include the expression from the ORDER BY clause that follows. For more information about using GROUP BY, see the article GROUP BY Clause. ORDER BY DateSerial(Year([OrderDate]),Month([OrderDate]),1) This line is an ORDER BY clause. It tells Access to sort the results in ascending order using the values of the field (or in this case, the expression) that is in the clause. For more information about using ORDER BY, see the article ORDER BY Clause. When we used the Table Analyzer Wizard to normalize the data, the table created by the saved import specification was renamed and replaced by a query. We already used the query (named tblImport) in the append queries. It’s a best practice to use three-letter prefixes with object names to indicate the type of object – that’s why the append queries all have names that start with qry. Because we already have the normalized tables that we need and have imported the data into them, we’ll drop the table that was renamed and the query that replaced it. The next time the saved import runs, the tblImport table will be created again, and will serve as the data source for the append queries. In the Navigation Pane, right-click tblImport, and then click Delete. Click Yes in the dialog box that appears. In the Navigation Pane, right-click tblImport_OLD, and then click Delete. Click Yes in the dialog box that appears. Macros are an easy way to automate processes in Access. The following video provides an introduction. You can use a macro to automate the process of importing data. You can then run the macro, instead of running a series of queries. On the Create tab, in the Macros & Code group, click Macro. In the new macro, click Add New Action, type On, and then press ENTER. Access completes typing the OnError macro action, and displays the Go to and Macro Name arguments. Select Macro Name in the Go to argument. In the Macro Name argument, type ErrorHandler, and then press ENTER. Click Add New Action, type RunS, and then press ENTER. Access automatically completes typing the RunSavedImportExport macro action, and displays the Saved Import Export Name argument. Select Import-MonthlySalesData in the Saved Import Export Name argument. Click Add New Action, type SetW, and then press ENTER. Access completes typing the SetWarnings macro action, and displays the Warnings On argument. Leave the argument set to No. Click Add New Action, type If, and then press ENTER. Access creates an If block. An If block lets a macro evaluate an expression and perform different actions depending on the result of that evaluation. For more information, see the MSDN article If...Then...Else Macro Block. The expression checks to see whether the month and year values in the table tblImport do not show up in the results of the query qryMonthsAlreadyImported. If so, then the macro performs the actions in the If block. If not, the macro does not perform the actions. Click Add New Action, type OpenQ, and then press ENTER. Access completes typing the OpenQuery macro action, and displays the Query Name, View, and Data Mode arguments. Select qryAppendProductCategoryFromMonthlyImport in the Query Name argument. Do not change the other two arguments. Select qryAppendProductNamesFromMonthlyImport in the Query Name argument. Do not change the other two arguments. Select qryAppendRegionFromMonthlyImport in the Query Name argument. Do not change the other two arguments. Select qryAppendOrderDetailsFromMonthlyImport in the Query Name argument. Do not change the other two arguments. In the lower right corner of the If block, click Add Else. Access creates an Else block. An Else block always follows an If block, and contains the actions the macro performs if the expression in the IF block is not true. In the Else block, click Add New Action, type Mes, and then press ENTER. Access completes typing the MessageBox macro action, and displays the Message, Beep, Type, and Title arguments. ="Data for the month of " & Format(DMax("[OrderDate]","[tblImport]"),"mmmm yyyy") & " has already been imported." This expression retrieves the month and year from the table tblImport and adds text to either side of it to produce a string that serves as the message Access displays if the data has already been imported. Select Information in the Type argument. Do not change the Beep or Title arguments. Click Add New Action, type RunSQ, and then press ENTER. Access completes typing the RunSQL macro action, and displays the SQL Statement and Use Transaction arguments. In the SQL Statement argument, type DROP TABLE [tblImport]. Do not change the Use Transaction argument. Click Add New Action, type SetW, and then press ENTER. Access completes typing the SetWarnings macro action, and displays the Warnings On argument. Select Yes in the Warnings On argument. Click Add New Action, type Sub, and then press ENTER. Access creates a Submacro block. A Submacro block contains a macro that can be run inside the macro that contains it. This Submacro block will contain a macro to handle any errors – we referred to it already near the beginning of this macro. In the box next to Submacro:, enter ErrorHandler. This is the name of the submacro. In the Submacro block, click Add New Action, type Mes, and then press ENTER. Access completes typing the MessageBox macro action, and displays the Message, Beep, Type, and Title arguments. This expression creates a message that specifies the error number and description when an error occurs. Select Critical in the Type argument. Do not change the Beep or the Title arguments. Press CTRL+S. In the Save As dialog box, type mcrImportMonthlyData, and then click OK.
For more information about creating macros, see the article Create a user interface (UI) macro, and the section Further reading. Now that we’ve got a macro automating much of the process, let’s walk through using it to import the remaining data. In Windows, browse to C:\MonthlySalesReport\MonthlyData\. Rename the file MonthlySalesData.txt to January 2010Sales_imported.txt. Move the file named February2010Sales.txt from the MonthlyData folder to the MonthlySalesReport folder, and rename the copied file MonthlySalesData.txt. In Access (with your version of the sample database open), in the Navigation Pane, double-click mcrImportMonthlyData. Repeat steps 2 through 4, but each time use the next month. For example, the second time, in step 2 you rename the file that has February in its filename, and in step 3 you copy the file that has March in its filename. Continue repeating the steps until you have imported all the data. This will be apparent because there will be no more files in the MonthlyData folder. After you get your data into normalized tables and set everything up for future imports, it’s time to create reports – the summary you can distribute to other people to help them make decisions. A report is a database object that you use to display and summarize data. Reports provide a way to distribute or archive snapshots of your data. Reports can provide details about individual records, summaries across many records, or both. You can also use Access reports to create labels for mailings or other purposes. Report Header This section is printed just once, at the beginning of the report. Use the report header for information that might normally appear on a cover page, such as a logo, a title, or a date. When you place a calculated control that uses the Sum aggregate function in the report header, the sum calculated is for the entire report. The report header is printed before the page header. Page Header This section is printed at the top of every page. For example, use a page header to repeat the report title on every page. Group Header This section is printed at the beginning of each new group of records. Use the group header to print the group name. For example, in a report that is grouped by product, use the group header to print the product name. When you place a calculated control that uses the Sum aggregate function in the group header, the sum is for the current group. You can have multiple group header sections on a report, depending on how many grouping levels you have added. Detail This section is printed once for every row in the record source. This is where you place the controls that make up the main body of the report. Group Footer This section is printed at the end of each group of records. Use a group footer to print summary information for a group. You can have multiple group footer sections on a report, depending on how many grouping levels you have added. Page Footer This section is printed at the end of every page. Use a page footer to print page numbers or per-page information. Report Footer This section is printed just once, at the end of the report. Use the report footer to print report totals or other summary information for the entire report. For a more thorough overview of reports, see the article Introduction to reports in Access. A common reporting need is to summarize data across a set of attributes. For example, a sales organization might want to see sales summed across the categories of products sold. The following procedures show how to create a query data source and a report that displays sales by product category using the sample data. In the Show Table dialog box, double-click tblOrderDetails, tblProductName, and tblProductCategory, and then click Close. Access adds the tables to the query design window. On the tblProductCategory object, double-click ProductCategory. Access adds the field to the query grid. Right-click the second column in the query grid, and then click Zoom. In the Zoom box, type Gross Sales: OrderQty*UnitPrice, and then click OK.
Right-click the third column in the query grid, and then click Zoom. In the Zoom box, type Net Sales: (OrderQty*UnitPrice)-(OrderQty*StandardCost), and then click OK.
On the Design tab, in the Show/Hide group, click Totals. The Total row appears in the query grid. In the Total row, select Sum in the second and third columns. On the Design tab, in the Results group, click Run. The query runs, and displays gross and net sales for each of the 35 product categories. Press CTRL+S, type qrySalesByCategory in the Save As box, and then click OK. In the Navigation Pane, click qrySalesByCategory. On the Create tab, in the Reports group, click Report. Access creates a report based on the selected query and opens it in Layout view. Adjust the layout of the report to make it easier to read. You can adjust the width of a layout column by dragging its edge. Consider changing the labels to make them easier to read, such as by adding spaces and removing unnecessary elements. Press CTRL+S, type rptSalesByCategory in the Save As box, and then click OK.
Another common attribute that a sales organization wants to summarize across is region. The following procedures show how to create a query and report that display gross and net sales by region using the sample data. In the Show Table dialog box, double-click tblOrderDetails and tblSalesRegion, and then click Close. Access adds the tables to the query design window. On the tblSalesRegion object, double-click TerritoryName. Access adds the field to the query grid. On the Design tab, in the Results group, click Run. The query runs, and displays gross and net sales for each of the 10 sales regions. Press CTRL+S, type qrySalesByRegion in the Save As box, and then click OK. In the Navigation Pane, click qrySalesByRegion. Press CTRL+S, type rptSalesByRegion in the Save As box, and then click OK.
Another common reporting need is to summarize data over equal time periods, such as quarters. For example, a sales organization might want to see total sales per quarter. The following procedures show how to create a query and report that display the gross and net sales per quarter using the sample data. In the Show Table dialog box, double-click tblOrderDetails, and then click Close. Access adds the table to the query design window. Right-click the first column in the query grid, and then click Zoom. In the Zoom box, type Quarter: "Q" &Format(OrderDate,'q')&" - "&Format(OrderDate,'yyyy'), and then click OK.
Press CTRL+S, type qrySalesByQuarter in the Save As box, and then click OK. In the Navigation Pane, click qrySalesByQuarter. Press CTRL+S, type rptSalesByQuarter in the Save As box, and then click OK.
Often, you want to distribute reports on paper. Access reports are optimized for printing, and generally look better printed than other objects, such as tables or forms. Right-click the report that you want to print, and then click Print Preview. Access opens the report in Print Preview mode. If you need to adjust the report, right-click the previewed report, and then click Layout View. After you make any changes, on the Design tab, in the Views group, click View, and then click Print Preview. When you are ready to print, on the Print Preview tab, in the Print group, click Print. You may prefer to send a report via email, or transfer it to a disk separately from the whole database. You can save a report as a PDF or XPS file for such purposes. In the Navigation Pane, double-click the report that you want to save as PDF or XPS. Click the File tab, and then click Save & Publish. Under File Types, click Save Object As. Under Save the current database object, click PDF or XPS, and then click Save As. In the Publish as PDF or XPS dialog box, browse to the location where you want to save the new file, select the file type that you want in the Save as type box, and then click Publish. You may want to set options, such as the page range or whether to include non-printing information. If so, click Options before you click Publish. For more information about saving as PDF, see the article Save as PDF. For more information about saving as XPS, see the article Save as XPS. This section contains links to information about additional Access features and techniques. While they are not covered in the article, you can use these techniques to refine the database that you built using the sample data. For example, the form that displays when you open the sample database is a navigation form (listed below, under More kinds of forms), and it displays when the database opens because it is the default form (listed below, under Form options and techniques). Which view should I use: Layout view or Design view?